Rename Expert can automatically move files into existing or newly created folders. Thus, even larger amounts of data are sorted and reorganized in the shortest time. The depth of the thereby generated subfolders is adjustable. Thus you can create even complex folder structures with ease. 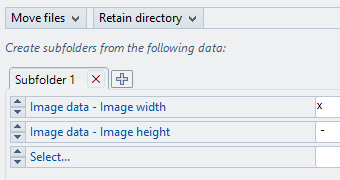 An example: "C:\data\PHOTO SHOOTING YEAR\PICTURE WIDTH x HEIGHT\"